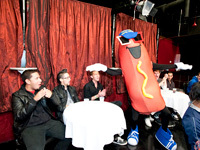 What would a sausage party be without a giant dancing sausage? Well it would still be a party full of good lookin dudes and male strippers sucking each other off, but now its a party full of good lookin dudes, male strippers and a giant dancing sausage. So remember its not truly a sausage party unless this dude makes an appearance.